Season now of broken hearts. Sparkling still in wistful gaze. For themselves some castles build. Words fail me.It was a magical read.Wonderful.Intense,painful,almost a song.The best of this year.Beautiful.Had I been a Prince (or,maybe a princess for that matter),I could have crowned you with the laurel.I cant express the effect it had on me.A dream,an yearning,pain,isolation,a strong plea to reach out and connect,to surrender; and she,a nymph ... wow!Splendid.Kudos to you. One little thing though,I did not understand one line: Straddling who-knows-what green lane. What is it supposed to mean?Forgive my incompetency but will you please explain? The 'dream-lit men', because 'dream-lit' are evergreen - unlike us poor mortals. wonderful feeling.if there is nationalism in India, its there on the cricket field.just amazing. someday we'll tell our successors, we lived in times of sachin and yuvi, zak and mahi. O yes,yes,yes! The great heroes and also Gautam Gambhir--my salutes to him for sheer nerves and absolute patience that day,poor soul got out at 97.But I shall proudly speak of the last sixer of Dhoni and the last catch of Sachin in the Indo-Pak semis,to my kids.I actually sprained my ankle when Dhoni hit that six,you see? (jumped) But the Lankan captain gained my respect with his words,as also Afridi had done.Perfect gentlemen!Dhoni was the perfect captain all along.Led right from the front. We can go on and on and on...The magnitude of the event is beyond any torrent of words we can come up with. The more we say the less it seems. I have watched Sachin's interviews in almost five different channels today.cant get enough of the euphoria! 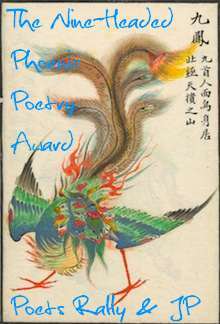 Its the National Poetry Month of 2011.Hope you celebrate it well by reading and writing the most wonderful form of literature with some passion.May your Poesy shine and live long! No matter whatever I say would be an understatement...bravo!